Pipe organs are best known for their towering pipes, large consoles, foot pedals, and their thunderous sounds. But despite their enormous size, these instruments are actually rather delicate, and tuning them is an exercise in precision and patience. In today’s blog, the pipe organ tuning specialists at Whitesel Church Organs will discuss some of the elements of the pipe organ tuning process. All instruments need to be tuned so that the notes that emanate from them all sound at the correct pitch. This ensures that the instrument sounds right and that chords are not harsh to listen to. Pipe organs need to be tuned regularly, as they are affected by changes in temperature in the room that the organ is in, as well as changes in the ambient temperature outside, especially when the seasons change. To make sure your organ is always in tune, it’s best to schedule regular visits from one of our tuning specialists. Generally, tuning is carried out two or more times throughout the year. The need for tuning is dependant on how frequently the pipe organ is played, the condition of the organ, and the temperatures and humidity levels the pipe organ is exposed to. All of these factors can impact how quickly a pipe organ can go out of tune. The process of tuning an organ involves a tuner and a tuning assistant. Together, this team sets the temperature of the room to the same temperature that the pipe organ will be played in. The tuner examines all of the pipes and inspects them for proper function and movement. The assistant sits at the console and plays notes at the tuner’s instruction. Both tuners listen to the sound of each pipe and make an assessment of the tone’s accuracy. If a pipe has been determined to be out of pitch, it can be adjusted by manipulating the pipe itself. Collars, slides, scrolls, caps, stoppers, and tuning wires are all changed ever so slightly, adjusting the length of the pipe until the pipe is playing the right pitch. To ensure that all of the pipes are in tune, generally one rank of pipes is tuned individually. The remaining pipes are all then tuned to the pitch of those pipes. Most pipe organs built within the last 100 or so years were tuned to equal temperament where the A pitch equals 440 hertz. If most of the pipes are already in tune, then the tuner and their assistant can perform a partial tuning, focusing only on the pipes that are out of tune. If many pipes need to be tuned, likely the team will simply re-tune all of the pipes. 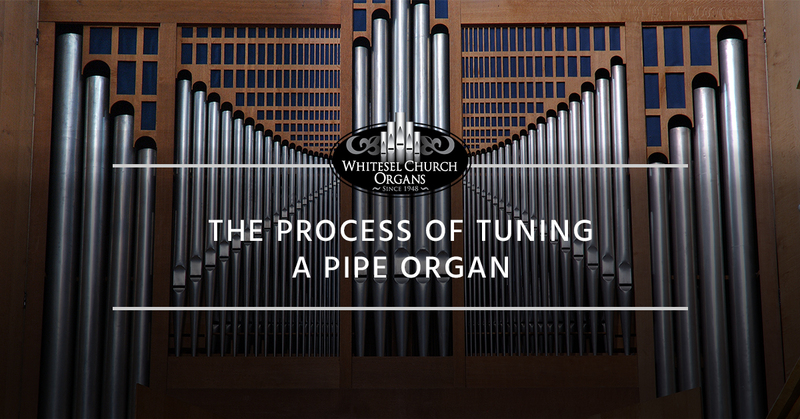 If you’re in need of a comprehensive tuning service for your pipe organ, be sure to connect with the specialists at Whitesel Church Organs. Whether it’s a partial tuning or more in-depth repair job, we have the skills, tools, and know-how to make your pipe organ truly sing. For a specialized proposal for your particular pipe organ project, contact us today.